When a massive star dies, it can collapse under its own gravity with such force that it produces a supernova, leaving behind an extremely dense remnant consisting almost entirely of neutrons—a neutron star. Some neutron stars, known as magnetars, possess powerful magnetic fields, which are stronger than any other known magnetism in the Universe. These intense magnetic fields somehow produce high-energy x-ray pulses, but this process is not well understood. Kazuo Makishima from RIKEN's MAXI Team and Teruaki Enoto from the RIKEN Nishina Center for Accelerator-Based Science in collaboration with the University of Tokyo and NASA have now found evidence that the magnetar 4U 0142+61 'wobbles' about its rotational axis, implying that the sphericity of the star is distorted due to an intense donut-shaped magnetic field at its core. "Magnetars emit high-energy 'hard' x-rays, but the origins of these emissions are unknown," explains Makishima. "We observed 4U 0142+61 using the Suzaku x-ray astronomy satellite to find out whether the magnetar's emissions change over time." The magnetar had previously been measured to spin at a rate of one revolution in about 8 seconds and to produce x-ray pulses of the same period, but Makishima and his co-workers noticed slow fluctuations in the arrival times of the x-ray pulses. They attributed these fluctuations to axial wobble, known as free precession. The star's axis precesses with a period that differs very slightly from the star's rotation period, and the slow beat between the two periods changes the observed emissions. "The idea of free precession was not in my mind when we started the data analysis," says Makishima, "but I was familiar with it through my long experience with spinning satellites. The precession is most likely caused by a slight deformation of the magnetar, and the deformation is possibly due in turn to internal magnetic fields that are even stronger than the external visible fields." 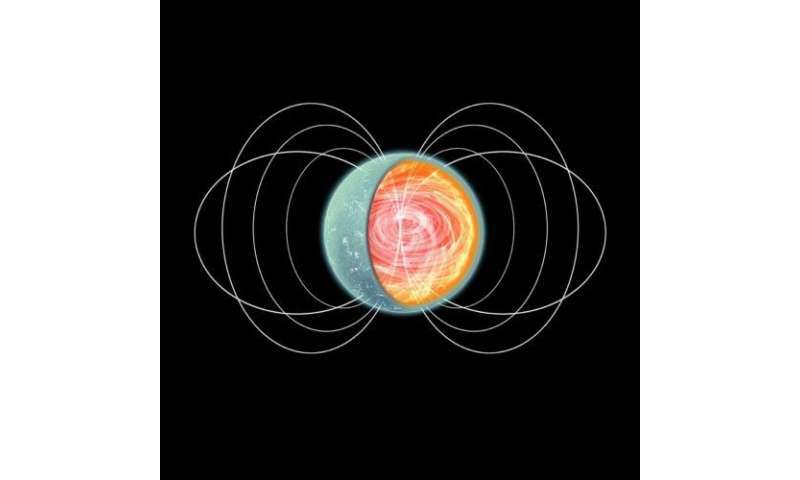 The findings suggest that the magnetar is deformed from a perfect sphere due to an extremely strong, tightly wound toroidal magnetic field buried deep in the star's core. The results therefore support the hypothesis that the hard-x-ray pulses are produced by consuming magnetic energy. Makishima's team plans to analyze a third dataset from 4U 0142+61 and search the Suzaku data for other magnetars that might show similar effects. "We will also propose observations of these objects with ASTRO-H, the powerful successor to Suzaku, which will be launched in 2015," he says. Would this also translate into a distortion of the stars gravitational field? These objects are a great example of overlap of gravity and electromagnetism and much more easy to observe than black holes. I'm curious why this particular stub was voted down. I found it very interesting, even if it's paywalled. Probably because the physics of neutron stars and magnetars are based upon pseudoscience. You don't understand what pseudoscience is, and frankly even that field is more distinguished than you. Yeah our models of neutron stars are imperfect, but that just means that there is more to learn. But the real point is that you can not appreciate the fact that we can even remotely understand what is happening in a region of space hundreds of light years away, and completely out of context of our everyday experience and just the simplicity of math can teach us about it. Top minds are working on it and that is the beautiful thing that you fail to appreciate. Steve your links are shite. As far as a distortion of time goes, here is a little blog to chew on. Almost a hundred years since he wrote that and we still do not have a clue because we still cling to his model and prefer the magical fantasy that is theoretical astrophysics. Look up in the sky! Is it a supernova...its a pulsar...no its a Neutron star. Faster than a speeding dentist drill more mass then multiple suns able to gravitationally collapse into a black hole! This is an important observation which illustrates a nearly seamless transition between dense neutron stars and black holes, which are routinely observed to behave in similar way. It points indirectly to the actual nature of black holes, which should behave like extremely dense, but still merely classical stars, i.e. not a pin-point singularities as the schematic GR models predict. Is that too long? Or not long enough? For your magnet theory I mean. How many times are we supposed to repeat the observing of it? After 14 minutes he dead so what's to see after that? .what supposedly is a neutron star made of again? Well no-Skippy my guess would be mostly neutrons. Is that wrong? Maybe you think it is magnets and stuffs like that? Okayeei. I got the 14 minutes part, now what comes next to finish up the ciphering to get there? Th einstein field equations have not been changed, the only thing that has changed is that we get better data, they've gotten MORE accurate with better measurements. It even contains the cosmological constant (the energy causing the exponential expansion of the universe). Relativity describes the universes structure, whether you "believe" it does or not doesn't matter, cause there are smarter people out there who "know" it does. Maxwells equations are freaking LAWS, the circuit exists because we understand how magnetism and electric fields interact, if you don't "believe" in Maxwells equations, you should have some self respect and get off your computer. "if I had wasted my time learning that math I would be as ignorant as someone who thinks a BH is a point of infinite gravity and that most of the matter in the universe is not currently detectable with our instruments." There in lies your problem. Learning something new NEVER makes you more ignorant, in fact that is the opposite definition of the word. I'm and Atheist, but I still read about Taoism, Coptic Christianity, Islam, ect. Not because I believe in it, but to integrate ideas and build my philosophy on life, and it is essential to understanding the world. If it was truly wrong and you actually understood the equations, you would have a leg to stand on with your criticism. But you don't, you just some dude with an invested interest in fundamentals of science being wrong so nothing will convince you. It's a medieval line of reasoning, close minded, archaic, and wrong. If you truly had an open mind, you would not fear learning something new, and evidence would be your persuasion. Yes your beliefs are, but you are willing to ignore a long history of observations falsifying accepted theory. Pulsars spinning faster than theoretically believed, spinning slower than theoretically believed, pulsars with to much mass, in the wrong orbit, with the wrong binary. How's that whole gravitational wave generator working for those neutron stars? Seems like Zwicky, Baade, and Einstein's GR kinda struck out, but keep the faith Mkay. "The clue is unbound neutron"
Ya right, a supernova explosion results in an implosion squeezing stellar protons and electrons together to form neutrons popping some quarks in the process and spinning at 24000 rpm as it becomes the magical neutron-degenerate matter. Pretty impressive for a mass energy of 0.000001 GeV. Funny we just can't seem to get them to bind to themselves and remain stable here on earth. "Maxwells equations are freaking LAWS"
Maybe you missed the part about plasma being Non-Maxwellian. Means does not apply. "The results therefore support the hypothesis that the hard-x-ray pulses are produced by consuming magnetic energy." This may be completely off the mark, but makes sense to me. My take being - magnetic energy is always there and being "Utilized", not "consumed". Or maybe they are looking at it with the wrong assumptions. Maybe a fresh look at the basics. Then a less exotic solution. Sure would go a long way to explain the pulsing with out physics defying oscillations.